The island of Mykonos is one of the top international tourist destinations, famous around the world for its cosmopolitan character and its intense nightlife. The island is part of the Cyclades. It spans an area of 105.183 km² (41 sq mi). There were 9,350 inhabitants in 2001 most of whom live in the largest town of Mykonos, known as Chora, which lies on the west coast. 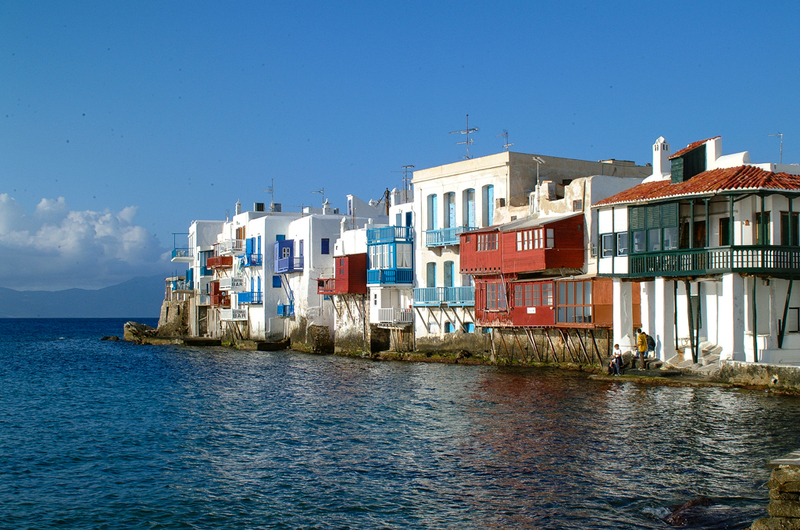 Mykonos has many beautiful sandy beaches with crystal-clear waters, sea-side tavernas & bars. Interesting information concerning Mykonos you can find through the Greek Travel Pages (GTP) and Wikipedia. The "Old Port" which is in the main village called "Chora"
The "New Port", in Tourlos, which is just 2-3 kilometers away. It's walking distance but not if you are carrying luggage. The New Port is connected to "Chora" and the Old Port by Taxi or Bus. The main Taxi stand is situated on the waterfront in Chora on the far right when looking at the sea. The main bus station is near the windmills on the top side of Chora. Conventional ferries: Minimum 5½ hours - max 7 hours depending on the vessel and the route.